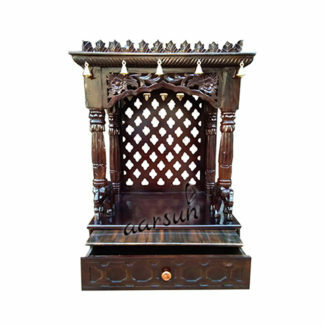 Aarsun Woods brings to you this handmade Wooden temple / Mandir / Pooja Ghar in Antique Traditional finish for homes and offices. Mandir is made up of Sheesham wood (Indian rosewood) along with teak plywood at the base. At the top of the mandir there are three beautiful domes having flower embossing carved by our artisan and a holy word “OM”written over there. Along the edge of the tapering, a gracefully carved wooden border hangs down at the front to enhance the appearance of the mandir. The level is surrounded by elegantly carved hard rosewood piers which also provide the requisite support to the roof of the cabinet. The base area is made up of teak plywood and the back side has wooden jaali. The base of the rosewood pooja mandir cabinet consists of a square shaped pedestal supported by round wooden feet on all the corners and floral carving cover the drawer area and lower part of the mandir. Over this base on the next level is a complete drawer to store the essential ritual miscellany, such as camphor, lamp oil, incense sticks, rose water, tiny brass bells etc.above that there is wooden tray. An inviting piece of architecture which is a value addition to your depiction of God!